We've seen a lot of high-end and flagship mechanical keyboards in recent reviews. Such models typically come with features like per-key RGB backlighting, brand new Cherry MX switch variants and advanced hardware or software customisation options. However, they also come with high price tags i.e. in the region of £150, which makes them out of reach for most consumers, especially those who might only be buying their first mechanical keyboard. 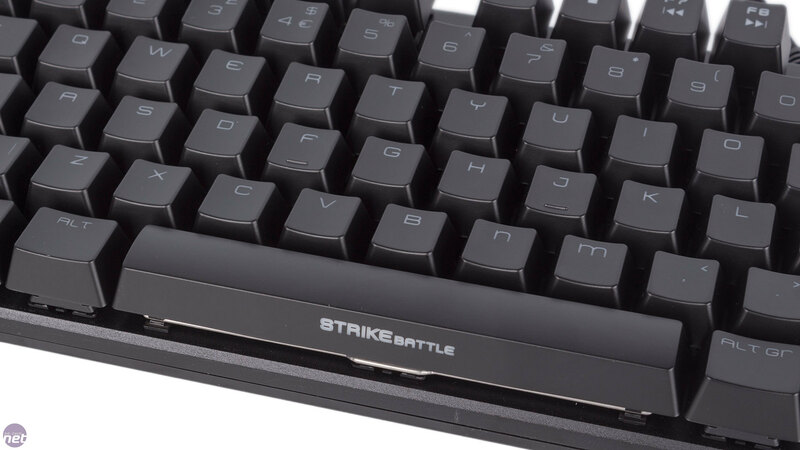 That's where something like the Strike Battle from Ozone comes in, offering a full, albeit tenkeyless, mechanical experience and a host of gaming-oriented features for under £70. Despite having an aluminium faceplate, which is appreciated, the Strike Battle doesn't fully disguise its less expensive construction. 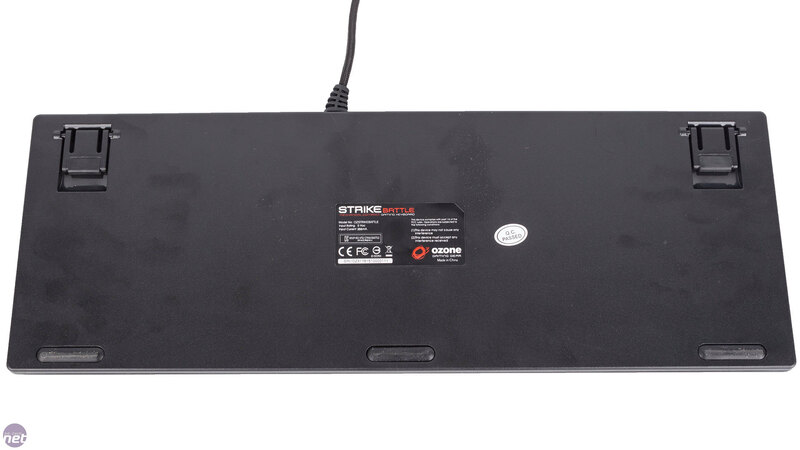 The metal is thin and the main plastic body is not reinforced, making it more flexible than what we're used to, though still considerably stronger than a basic membrane keyboard. The keyboard is also relatively light, giving it less grip than we'd like, especially without the rear legs extended. The 1.5m braided cable is non-detachable but is secured fairly well at the connection. With its tenkeyless design, the keyboard is extremely compact. 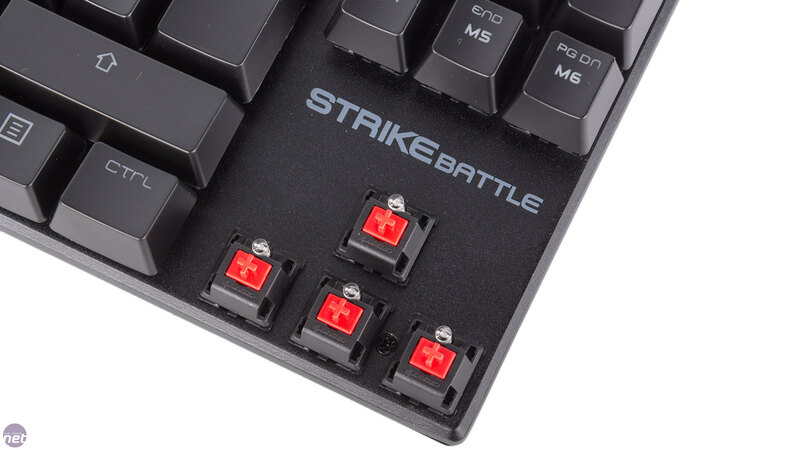 Pleasingly, the Strike Battle uses proper Cherry MX Red switches for every key instead of less expensive alternatives as you might expect. These offer the same consistent typing experience as ever, with a smooth, linear action without feedback. The ABS keycaps are fine, although also a little light feeling. 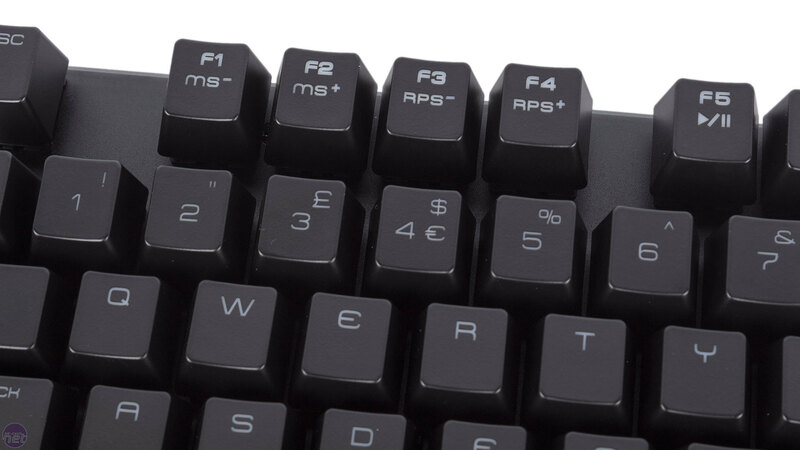 All keycaps are standard size though the font used is likely to be divisive. 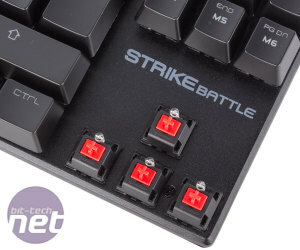 The Strike Battle offers n-key rollover and is available with either a red or black faceplate, as well as with Cherry MX Black, Blue and Brown switches, though availability probably varies by region. 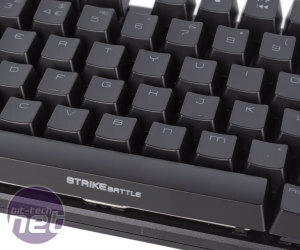 The Strike Battle lacks pass-through ports, understandably, but does offer red backlighting for all keys, with the lighting for the Scroll and Caps Lock buttons, as well as the Gaming Mode one, acting as their indicators. 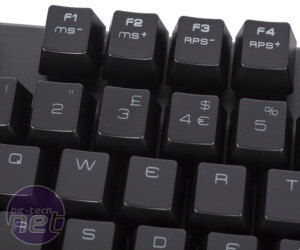 The effect is mostly even, with symbols being constrained to the middle and top of the keycaps, although it's not perfect – the number row and spacebar symbols evidencing this. The Ozone Function key (hereafter FN) used with Scroll Lock cycles the backlighting through six settings – breathing, four brightness levels and off. FN with F1 and F2 switches the polling rate through four options up to 1,000Hz, while F3 and F4 control something that Ozone calls key effective time, with seven options between 1ms and 16ms available. However, we could not detect any difference between any of the settings, making this feature somewhat arbitrary. The remaining eight F-keys can be paired with FN to control media playback and volume, with a media player shortcut included too. 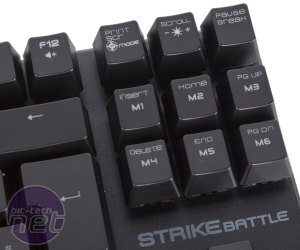 Gaming Mode is triggered with FN and Print Screen, in turn disabling the Windows key and enabling the six macro keys, M1-M6, above the arrow keys. While in this mode, FN and the Windows key swaps the arrow and WASD functions back and forth. The 64KB of onboard memory allows you to store up to 30 macros across the five onboard profiles. Sadly, on-the-fly macro recording isn't supported, and there's no onboard or automatic profile switching either. Instead, you'll need to download and install the driver package to access macro and profile features. The software is more functional than we were expecting for the price, and fairly intuitive. 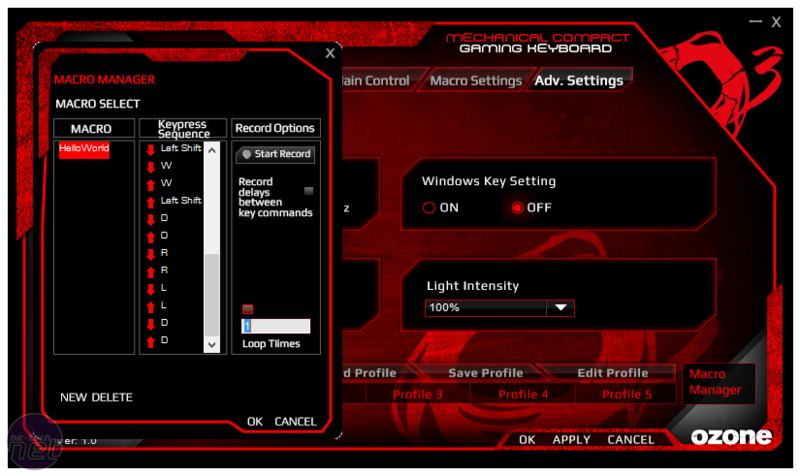 There are three main screens, with the macro manager and five profiles always accessible. 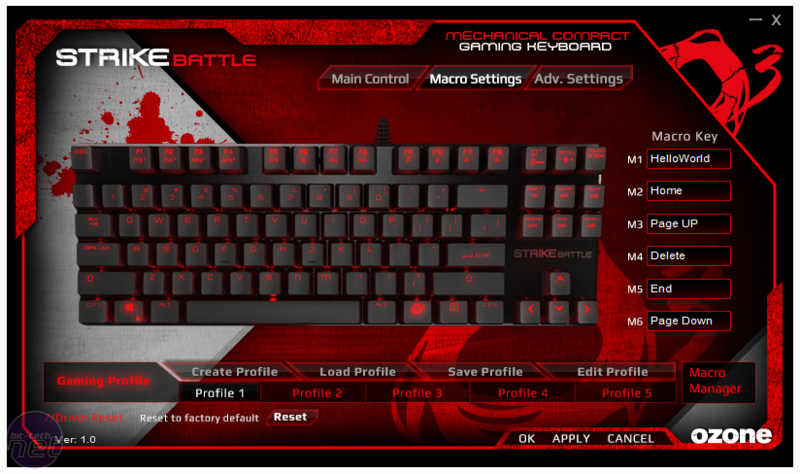 The main keymap allows most keys to be remapped to a different single key. 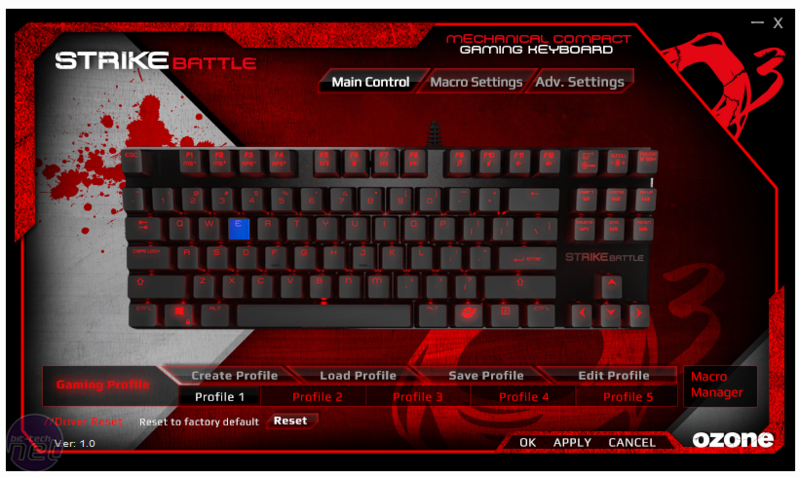 Keys glow blue when you hover over them to indicate default functionality and red once they've been reassigned. 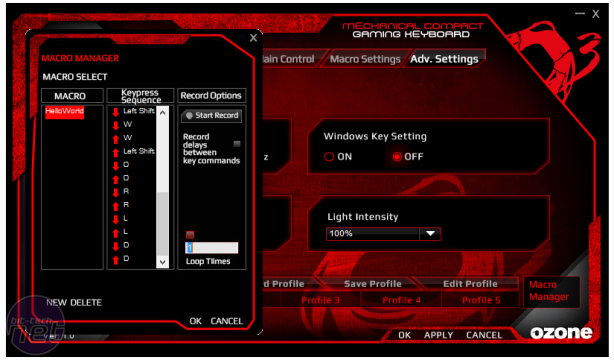 The Macro Settings page provides drop-down menus for M1-M6, with various media, Windows and custom macro functions available for each. Lastly, the Advanced Settings page is simply a different way of managing other settings like polling rate, brightness and so on. The macro manager itself is fine but a little basic. You do get the option to record delays, but even when you don't, a small delay between keystrokes is inserted when the macro plays back. Macros can be looped but more advanced playback options are missing. Our main complaint regarding the software is how long it takes to program settings after you click Apply, even if you've only made one simple change. The fact that settings are stored directly on the keyboard means they can be taken with you plug-and-play style, but we do wish it was more responsive. The Strike Battle is certainly not without flaws – elements of the build quality, certain features and parts of the software do not stand up to scrutiny, for example. However, once you take the price into consideration, these are quite easily overlooked. 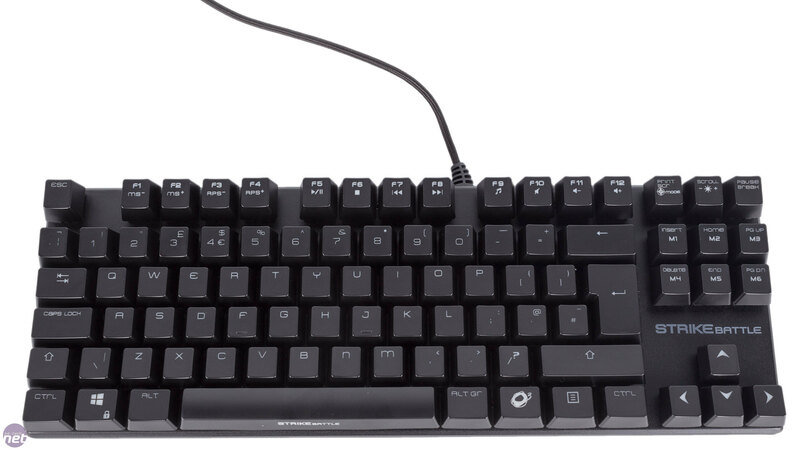 For under £70, you get a true Cherry MX keyboard that's great to type and game on, a compact and very portable chassis, full backlighting and some pretty good extra functions. Faster software would definitely be our first upgrade, but users of this calibre of keyboard aren't likely to be diving in and out of the software after the initial set-up phase. 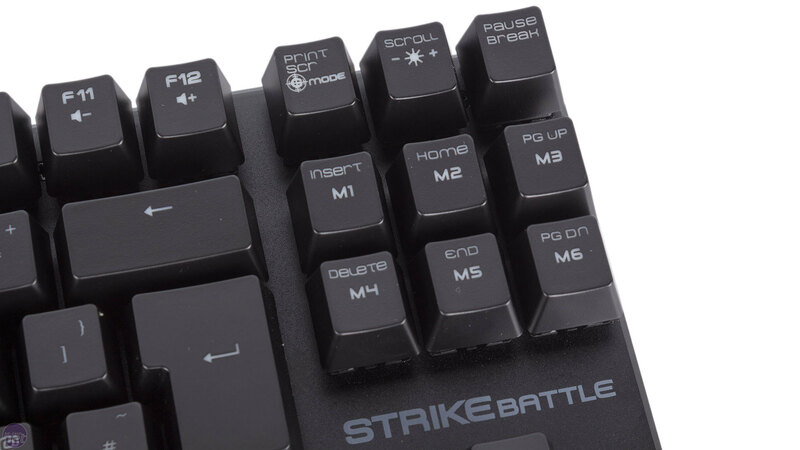 As such, if you're looking for a solid mechanical keyboard for a relatively low price, the Strike Battle is a compelling choice. No changes to staffing or launches. 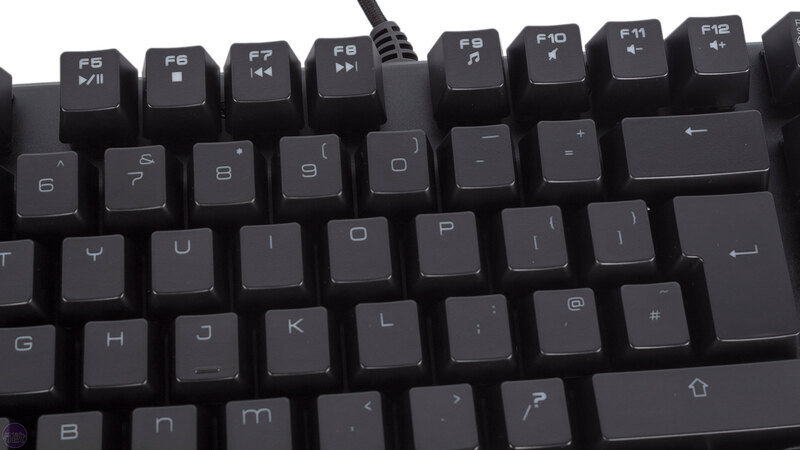 Backlit, tenkeyless mechanical keyboard for less than £80.